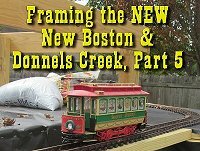 If you've been following my articles, you know that we moved in late 2016 and I spent much of 2017 trying to get the next version of my garden railroad installed. 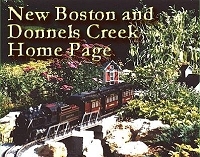 The infrastructure for the upper two layers has been built, and we have run short trains on both of them. 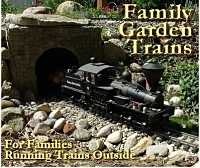 That said, when I started dumping gravel and dirt on the "tables," I realized it was way too easy for gravel to work its way under the track and cause the right of way to be bumpy or otherwise uneven. This was especially true for the upper layer which I can't look down on from some positions. So it was way too easy for an unseen bit of gravel to cause havoc. 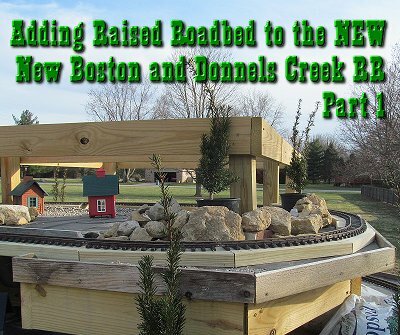 I decided to install a "raised roadbed" under the track. It wouldn't need to have plates or posts like an independent raised railroad would - just the "stringers." 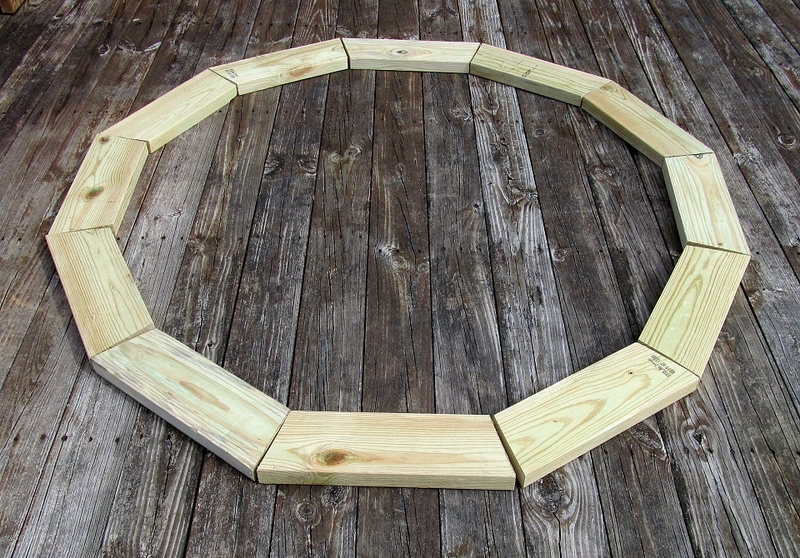 Those are the long trapezoid-shaped pieces that go together to make a circle and which the track sits on. 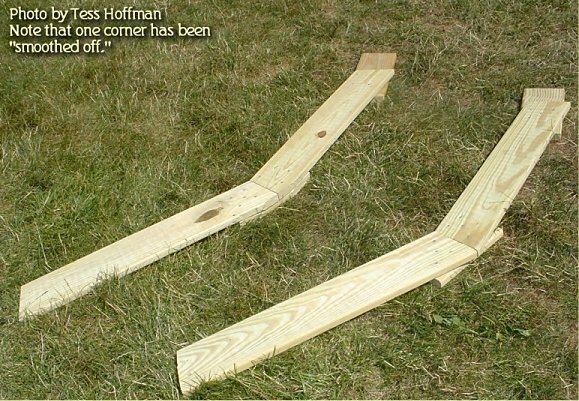 This involves getting a few 2"x6"x12' ground-rated boards and cutting them so they fit under the track I laid. In the past, I've done this to build raised railroads that attach to posts, but these boards will just get fastened to the tabletop under the track. 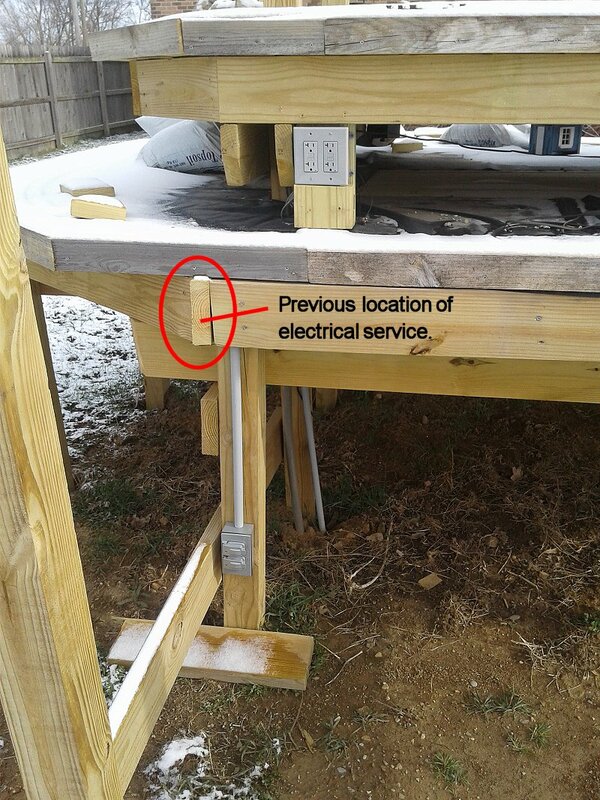 The photos below show examples of raised roadbed I built using 5/4" decking for a clinic (you can't use most 5/4" decking for ground contact applications, so imagine these were 2"x6" ground-rated boards). You can see the trapezoid-shaped "stringers" attached by "plates" that run underneath them. In the present application, the stringers are the only bit I need to cut. 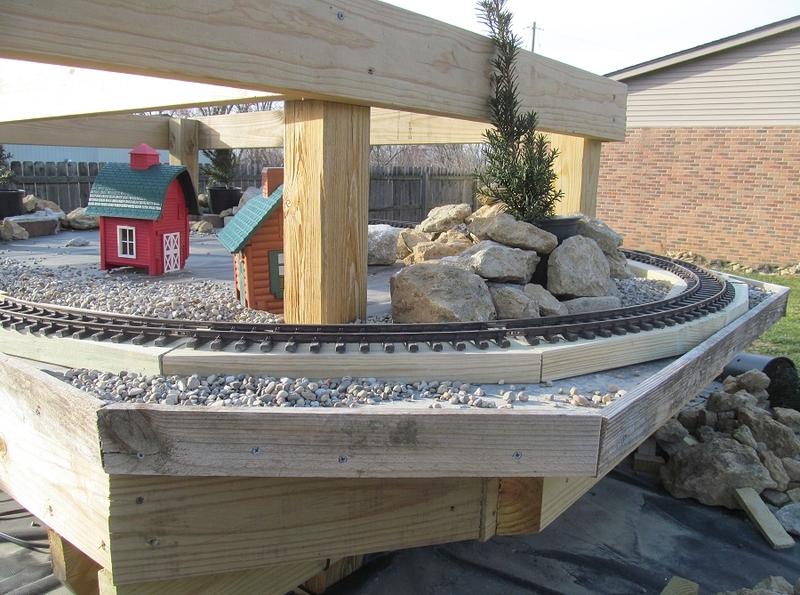 In some ways, it might look like I'm defeating one purpose of building an "outdoor train table" - the ability to change track plans without moving a bunch of dirt and posts. But for these two layers, I'm pretty satisfied with the track where it is, and it will still be easy to move later if I need to. I don't have to do this, and for a time I thought about putting it off until I got more of the big projects done. The track is very level, after all. If I was putting it on, say, astroturf, I would just leave things as they are. 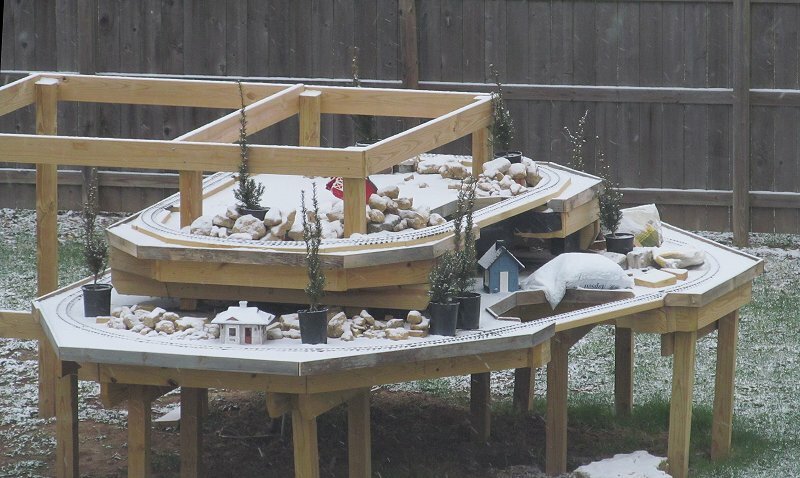 Also, these "tables" are going to be something like raised flowerboxes. 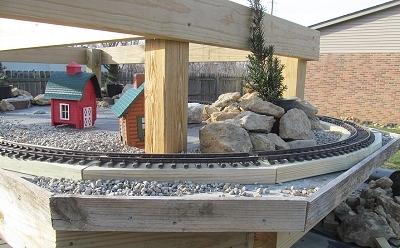 Raising the track 1 1/2" will allow me to put an inch more of dirt down, which will keep the plants that much happier. This isn't nearly as complicated as it looks. The instructions and templates for cutting the wood pieces easily are on my Simple Raised Railroad article. Because the top layer uses track that uses 12 pieces to a circle, I can use this template. I would need about 23 linear feet of 2"x6" boards to make this roadbed. 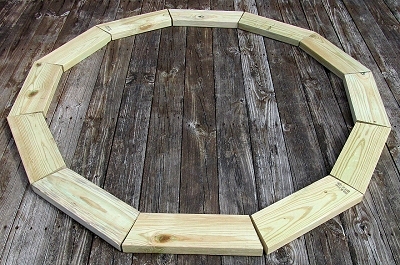 Because the middle layer uses track that takes 16 pieces to make a circle, I can use this template. I would need about 40 linear feet of 2"x 6" boards to make this roadbed. All told, about six 2"x6"x12' boards. Ordinarily, when I do this, I'm fastening these sections together with "plates" that go underneath, but in this case, I'll fasten them right down to the decking, on top of the vinyl sheeting I'm using to keep all the dirt from sliding through the cracks. As you know, I like using 2"x6"x12' boards because they generally have a better price per foot than shorter lengths. Also, you tend to get less waste when you use longer boards. The down side is that they're heavy. So I try NOT to buy more than nine or so at one time to avoid blowing the rear shocks out of my minivan. As it turned out, some of the pieces I bought wound up being used for another project. I started on the top level, since that's the one that would benefit the most. The curves come first. The photo below shows me using my template for 30 degree curves to mark the first cut. The next photo shows the template "flopped over" to the other end to mark the second cut. The next photo shows the first stringer as cut out. Check each stringer against the one you just cut to make certain it's not far off. Keep using your first stringer as your template. If you use the next stringer as the template for the next piece and so on, your stringers will keep getting longer or shorter, depending on how fat your marker is or how much material your saw blade converts to sawdust. Line up a few pieces of track over the first few stringers to make certain they're "close enough" to support the track properly. They won't be perfect, but you don't want them so far "off" you need to cut more pieces or some such. The photo to the right shows the stringers in a circle when I'm done. Of course there will be some straight pieces to cut, but those are easy. 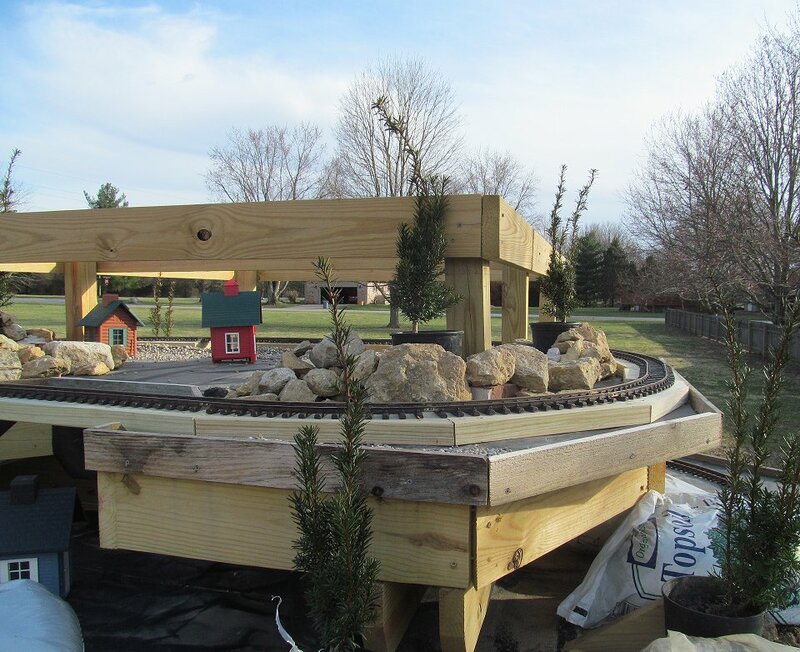 By the way, you'll notice that some of the track pieces don't align exactly in the center when you install them. For example, AristoCraft curves (my favorite track) tend to spring outward a degree or two from where they should be. Once you connect a circle or loop, you hardly notice, but if you just leave an arc of three or four together, they won't curve exactly as much as they "should." That's okay, the important thing is that they're supported. You'll remember that my track was already in place and screwed together. So I did NOT want to take everything apart. Instead I slid the stringers under the curves. At this point, the stringers still stick out in "points" wherever two join. 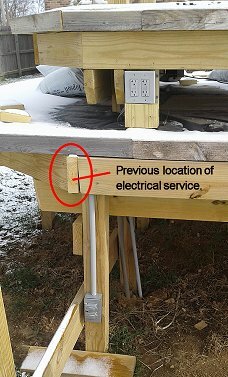 Some of those points bumped up against the edging I had already installed. So I marked and trimmed those corners off before I installed the roadbed there. In the photo to the right, you can see how the part that bumps up against the edging to the right has been trimmed back a little. If I hadn't installed the trim already, I could have just installed the roadbed, then trimmed off that corner. When I was sure the stringers were aligned where they needed to be, I used 3" deck screws to screw them down on top of the vinyl. Then I cut the long straight pieces I needed. There's not a problem with screwing through the vinyl, since that has drainage holes anyway. Though I thought that looked fairly nice, I can't help thinking that taking a little more wood off the other corners would help it look even nicer. 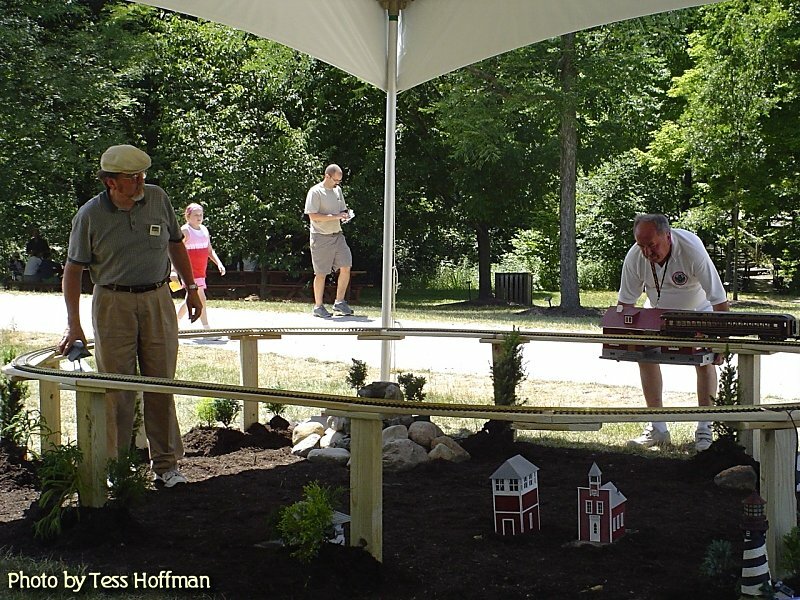 Paul Busse's company Applied Imagination uses a very expensive saw that cuts curves to get a very smooth effect (you don't notice because they line the roadbed with tree bark or some such). But my saw doesn't work that way. The next step will be to move the track aside and set a circular saw to exactly 1.5" depth. When I've finished the upper ROW, I'll proceed to the lower ROW. Why am I talking in future tense, when I should have easily finished this project by now. It's because every time my schedule would have permitted me to work outside, it snowed. Seriously. Right after I did the work described above, it snowed and it has snowed every few days since. Or else sleeted, or turned bitterly cold, or brought brutal winds. The photo to the right is actually from April 9, a date that - in this part of the country - usually involves shirt-sleeve weather and flowers everywhere. I told Shelia we had February in March, now we're having March in April. Also, I confess, I borrowed one of the 2"x6" boards I was going to use on the lower level to do another project - hanging corrugated steel in a little nook on the back of our house. That's another project I won't describe in detail, even though the results are looking good so far, because I'm not sure the building codes in everyone else's location would permit some of the approaches I had to take because of a previous owner's screw-ups. If you've ever bought an older home, you know what I mean. 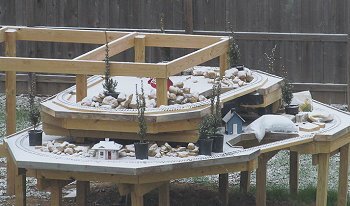 Now that track is installed on two of the layers, it has become apparent that - with the slope of the yard being what it is, the lower layer should NOT be as low as I had planned. If I make it too low, it will be nearly ground level near the east end, not something I want. So it will have to be raised several inches from my original plan. No, I'm not installing that layer right away, maybe not even this year, but I realized that the board I had installed my electrical outlets on would be in the way. So I moved the outlets up a little higher and removed the board they were mounted on. (Imagine the board that is circled in the photo to the left sticking out several inches.) I also ran an additional line a little lower so I would have easy access later, once the "main" outlets were a little more blocked in. If you've just dialed in, let me fill in some blanks. A huge in-ground swimming pool used to be located near where the railroad is going in. When I had the back yard regraded to fix the problems caused by a previous owner who "filled in" the pool with construction waste, the Bobcat driver pulled the ends of two conduits out of the ground. Testing carefully, I realized that one contained a 110v line and the other contained a 240v line (for the pool heater). I converted the 240v line to 110V, so the two GFI-protected outlets you see side by side are actually feeding two separate lines. They will be protected from the weather when I build the shed, but in the meantime, they're safe enough, because they're rated for this kind of installation. Again, I'm not publishing details on my electrical projects, because I don't want to get sued if someone attempts to follow my instructions and electrocutes themselves or sets their train shed on fire. But I will say that all of the circuits are GFI protected, all wiring is outdoor-rated, and all exposed wiring is in appropriate conduits. Other Trim Bits - Some additional wood bits that will keep the dirt in its place. Starting the Waterfall - It won't be finished entirely until I build the lower, outer layer, but I want to get the upper part going. Shed Floor - Even though I'm not building the shed right away, I want to build the floor part to give me a better place to stand when getting trains on and off the track. As anxious as I am to get onto the really big tasks, I think a year of getting the bits I put together so far under control will be a better use of my time. Not to mention that there are several big projects I need to do on the house we moved into. It's time to "consolidate gains" versus "breaking new ground," I think. And if I get these projects done, they will be giving me something of a head start on either of the "big projects" I have planned. That will be another article. And maybe another year. . . . 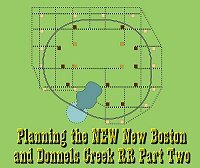 Proceed to "Adding Raised Roadbed to the NEW New Boston and Donnels Creek, Part 2 - Trimming the corners off the roadbed on the upper layer and cutting the pieces that will support the curves on the middle layer. 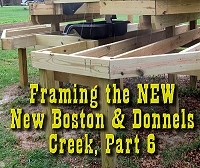 We need to get the upper two tiers of the pond installed before we totally complete this step, so the article doesn't show the finished product. You'll see it later as part of other articles.